Now, I realize opinons about cooked cabbage my not be as enthusiastic as mine, but if you haven't had it in a while, try it again. Just cook until tender-crisp, not soggy. And understand, I grew up eating my German/Polish Grandparent's cooking, so anything with cabbage is gonna be a hit. Sauteed with some Field Roast sausage (my favorite "faux sausage" in the world, but use whatever you like) and really, how can you go wrong? Sautee Field Roast sausage slices with onion over med. heat until they start to brown. Add cabbage and cook, stirring frequently, until cabbage is done. Sprinkle with vinegar, salt and pepper to taste. Oooh -- yum! I, too, like cooked cabbage. Must be my German and Polish heritage! 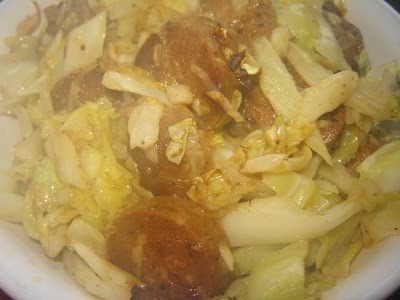 I love cooked cabbage--I have it at least once a week! Thanks for a yummy recipe for it! No, steam just makes it more tantalizing. I'm with you on the field roast sausages and cabbage. i loooove cooked cabbage. My mom sautees it with tahini. Soo good. I would love to eat that dish! Cooked cabbage is great! Also, congrats on that sumer splurge - the patio fire pit! Great idea! I've never tried Field Roast sausages. Looks good! Oh yummy!! I will have to look for the sausage at the super market. If I can't get it there I will look for it next time we get to Whole Foods. Mmm-mmm-mm-mm-mmmm! I'm with you on the enthusiastic cabbage eating!